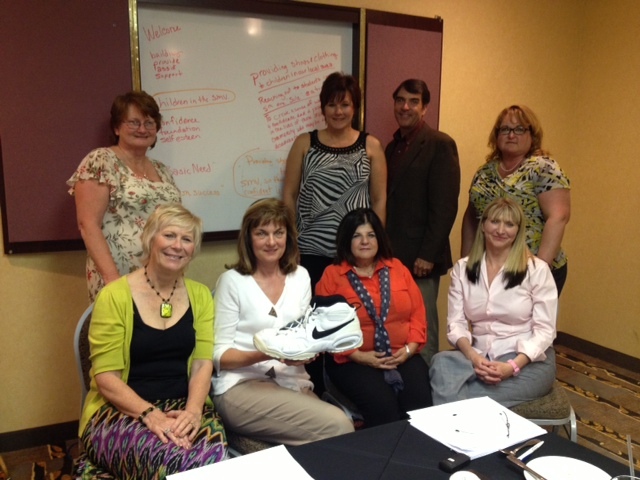 Shoes for Students is an amazing homegrown organization that supports the children and families in our local communities. In 1998 we noticed that there were some students in our schools that did not have proper shoes. Either they were very worn, very old, the wrong size, or some other problem. After speaking to school representatives we realized there was a real need in the community where this was concerned, so Shoes for Students was born. We now serve students in Santa Maria-Bonita, Orcutt, Casmalia, Guadalupe and other local school districts. All of our aid is completely confidential. WE don't even know which students are running around at recess in our shoes! When a teacher or administrator at a school, or a representative from a local social service organization, recognize that a student needs a pair of shoes and sees that it is beyond the means of the family to rectify the problem, they request a gift certificate. We currently work with Payless Shoe Source who sells us certificates at a discount, which allow the students to go and pick out their own new shoes. Although we don't get to know who we help, we have received letters from students telling us how excited they were to go shopping for their shoes. Many times this is the first time they have ever owned a brand new pair of shoes! Because we live in a generous community we have been able to expand our support in addition to shoes and clothing. In the past we have been lucky enough to have funds available to be able to provide musical instruments to the school districts to have available so that students could participate in the music program, to help funds the arts programs, to provide matching funds so that EVERY child in the Santa Maria-Bonita School District was able to take home three books for their private library, and fill in other small gaps that occur when budgets get cut.